A museum in Berlin about the Stasi, or "Staatssicherheit" = 'state security', i.e. the former GDR's secret police/intelligence agency. The museum is housed in the original Stasi headquarters building in east Berlin and includes exhibitions about spying technology, communist propaganda, resistance movements and repression. 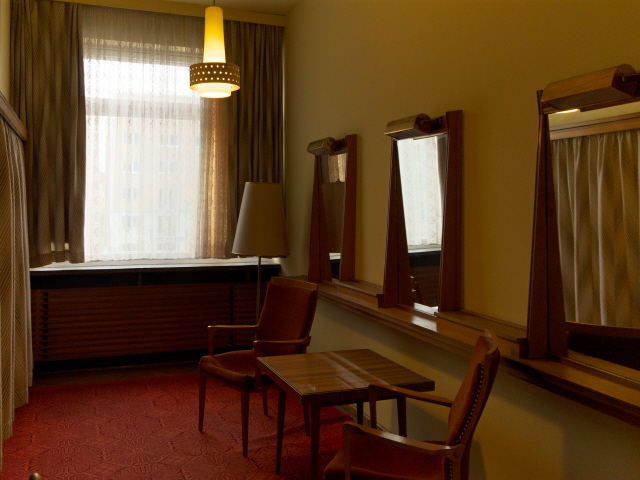 The floor where the top Stasi man, Erich Mielke, had his office and private rooms has been preserved – with all the stuffy 1960s GDR-era interior design “glory”. More background info: For more background see also under Stasi, Hohenschönhausen, Stasi exhibition and Runde Ecke, Leipzig. The Stasi was an enormous apparatus of secret police and military intelligence all under one umbrella of State Security for the GDR. The administrative efforts necessary for an organization of this size demanded huge administrative buildings too. The central one in East Berlin eventually covered a whole block of several high-rise buildings at Normannenstraße. As the site expanded, various older buildings were bulldozed to make space for the developments, roads leading towards the complex were blocked off for public access, so the whole are became a “forbidden zone” and on maps it was left as a white empty space. The inner ring of buildings shielded the central command centre, called “Haus Nr. 1”, from outside view completely. This House No. 1 was the very heart of the Stasi, its nerve centre, so to speak. 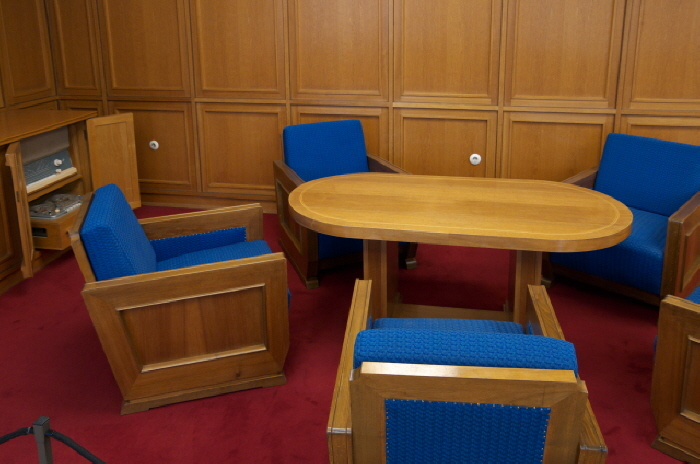 The head of the Stasi, Erich Mielke, had his office and provate rooms here too. It is this building that now houses the museum. 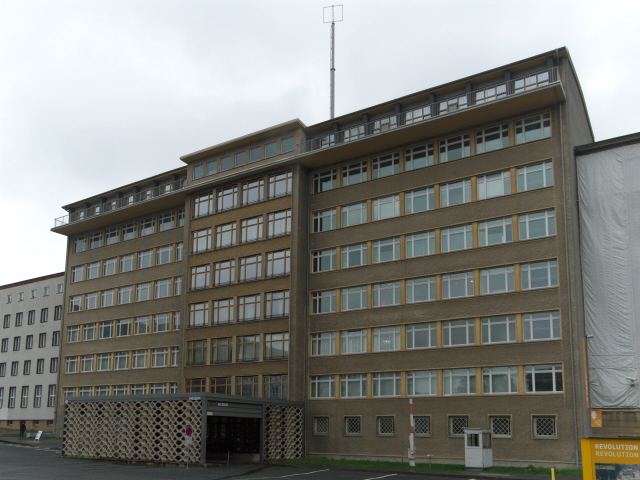 Another building houses the tons of Stasi files that were left after the fall of communism. Victims of the Stasi (i.e. people who were spied on – or worse) have a right to access their own personal files. These often contain shocking amounts of detail, revealing the lengths the Stasi went to in their surveillance of the population. Often they also reveal the ridiculous attention to hardly relevant details – and frequently contain plain errors or deliberately fabricated stories too. Apart from developing spying tools and technology – often of stunning ingenuity– the Stasi also served as a major political-ideological education branch for the communist regime, or parts of its elite. When the Berlin Wall came down – and with it the GDR – so did the Stasi. As early as January 1990, the premises of the Stasi HQ at Normannenstraße were taken over by the Berlin Committee of Citizens (cf. Runde Ecke), who formed part of the Peaceful Revolution in the GDR and its subsequent political rebuilding. It was quickly decided that the site at Normannenstraße should be turned into a memorial and research centre. 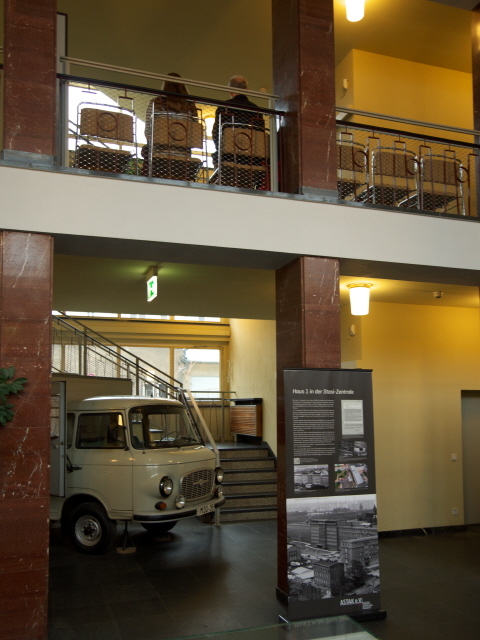 Apart from the museum, which is open to the general public, the former Stasi HQ also houses a couple of organizations engaging in such research in connection with coming to terms with the past, or at least this part of political persecution perpetrated by the GDR. Not so long ago, the main exhibition in House No. 1 was completely reworked and expanded, made bilingual for international visitors, and now also incorporates parts of what used to be the separate Stasi exhibition (which was therefore closed) in the centre of Berlin. The new exhibition opened in 2015. And it has clearly boosted the popularity of this site. When I first went there back in 2008, there were very few other visitors and often I would have whole rooms to myself. When I went back in April 2017, there was a long queue at the ticket booth to begin with, and in the exhibition it often got so crowded that I had to wait for other people to move on before I could take a proper look at the displays or use a video station. Be forewarned. When I was last here there was also a rather large open-air exhibition about the Peaceful Revolution of 1989 in East Germany. But I presume that is/was only a temporary installation. I had only a very cursory glance at it and saw many familiar, even classic images from the time, but I didn't bother reading the texts (presuming it would all be quite familiar to me as well – but for a novice it might provide a good intro). What there is to see: The first thing to take note of when you get to the building, which itself is quite imposing (in that 1960s kind of way), is the covered driveway in front of the entrance. This was actually added later so nobody could see who was arriving by car and entering the building, or when they exited. Also note the guard hut and sawn-off barrier next to the entrance. Inside the foyer there are already a few exhibits, including a large scale model of the entire Normannenstraße Stasi complex, which included not just this house but a whole group of other high-rises and ancillary buildings too. In a corner a resolute-looking statue of Karl Marx stands by some old red party flags. And huddled under the staircase's first flight a van is parked. It's one of those special vans that was used by the Stasi to transport prisoners and for delivering them to the various special Stasi prisons such as the main remand prison in Berlin: Hohenschönhausen. Also still on the ground floor, off a corridor branching off to the left of the foyer, is a canteen – and in a glass cupboard you can admire some old bottles of the types of drinks that apparently were favoured by the Stasi boss Erich Mielke (e.g. sickly-sweet-looking coffee liqueur, counterfeit vermouth from Bulgaria or sweet wines from Hungary). As a sign explains, these bottles were found in Mielke's private kitchen on the second floor (see below). 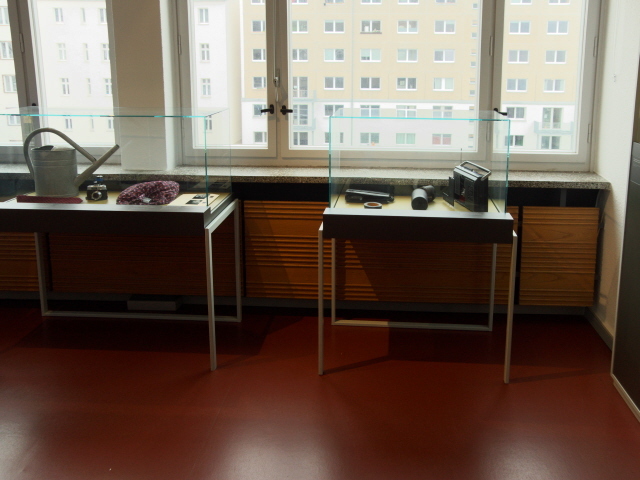 The Stasi exhibition as such is spread over the three floors above and is subdivided into different thematic aspects. All texts now come with a translation into English (of good quality) and all videos have English subtitles. That's a great improvement on the old exhibition I had seen back in 2008. This new one is now of an international standard, also with regard to the usual “media mix”, i.e. through the inclusion of video screens and audio stations in addition to the traditional text-and-photo panels and the display of artefacts. The latter come in a plethora of forms and are clearly the greatest strength of this exhibition – see below. 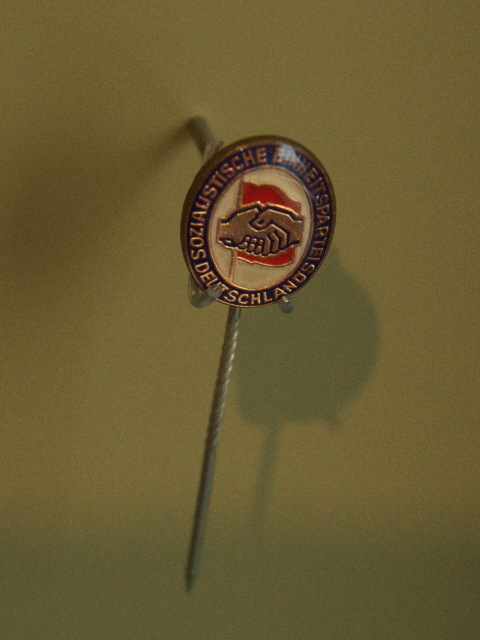 On the first floor you get an introduction to the mission of the Stasi and the ideology behind it and the GDR. The links to the Soviet “brothers in arms”, in particular the KGB are touched on too, especially their shared rooting in the Chekist legacy (from “Cheka”, the first political police in the young USSR). Furthermore you get insights into how the Stasi recruited its staff, both regular, properly employed staff as well as the so-called “IMs”. This abbreviation stands for “Inoffizielle Mitarbeiter”, 'unofficial collaborators', i.e. quite ordinary citizens who the Stasi convinced or coerced into spying on their fellow contemporaries, even family members. What kinds of operations the Stasi undertook is illustrated – and this included a vast range, going far beyond mere observation and deliberate disinformation (but even included abductions of persons from the West, break-ins, rigged court cases and executions). The Stasis's relation to other branches of the state apparatus comes into focus here as well. Needless to say there's plenty of socialist propaganda to be seen here too, various medals and kitschy gifts that high-ranking members of the leading political elites of the GDR had exchanged. For starters there are the different types of spy cameras. Small cameras were built into bird houses in trees, hidden within portable radios or even worn – as in the (in)famous) button-hole camera. Other stationary cameras included a special model that could take wide-angle shots through a tiny 1mm hole in a wall (cf. Viru KGB Museum). All manner of listening devices and bugs are displayed too. One striking artefact is a door inside of which bugs for recording conversations had been hidden to spy on a family who had a Western relative, so the Stasi suspected them of spying for the West. They only found these bugs when they replaced that door 17 years after the fall of the Berlin Wall! The Stasi did not just watch and listen, they also opened private letters and surreptitiously read them. For this they devised special machines that could secretly open and reseal letters. The same thing was done with parcels sent from the West. In particular they were looking for items forbidden in the GDR, such as western publications or tapes. Money or valuables found were also often confiscated. Perhaps the most shocking method of surveillance and persecution even employed smell. The Stasi set up an archive of scent samples. These were typically obtained during interrogations. Pieces of yellow cloth hidden in the upholstery would take on the suspects' odour. 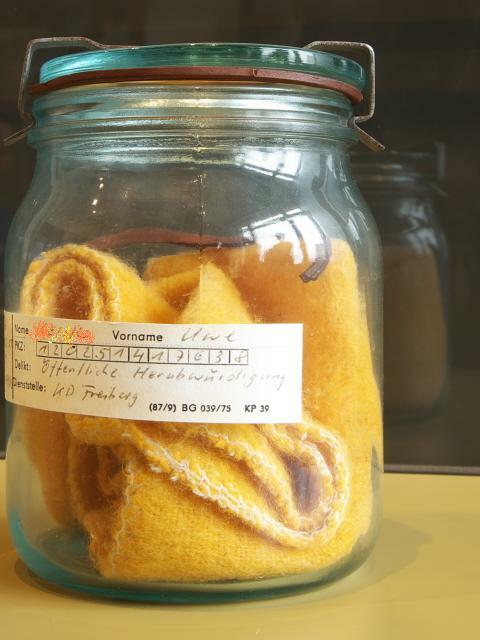 These pieces of cloth were then stored in sealed glass jars. If needed they could later be used to give to sniffer dogs. These could then recognize those people's scent, not just on the person as such but also in places he or she may have been or on objects touched by them. One such scent sample jar is on display at this museum too – together with a special chair for taking mug shots of suspects. 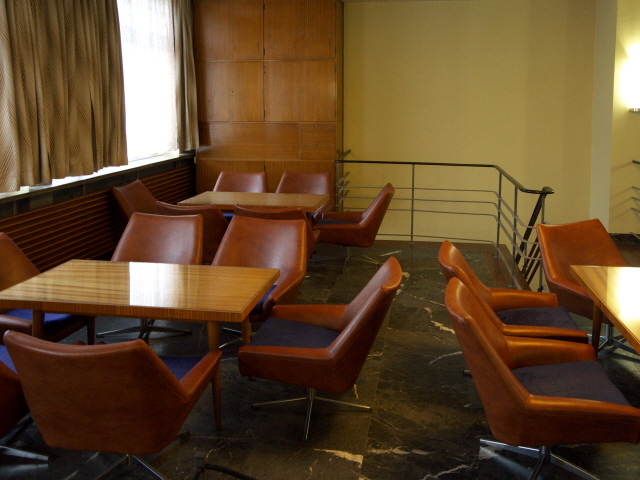 Further side rooms are dedicated to a couple of other organizations other than the Stasi that existed within the former state system, in particular the FDJ, the youth organization of the GDR (“Freie Deutsche Jugend” or 'free German youth'), the NVA (“Nationale Volksarmee” or 'national people's army') and the Volkspolizei ('people's police'). The final topical section is about the end of the Stasi in the turmoil of the latter part of 1989 and early 1990, when the Stasi panicked and began destroying their evidence. But emboldened protesters then stormed and occupied several Stasi offices, e.g. in Leipzig (see Runde Ecke), Dresden (see Bautzner Straße) and eventually at the Berlin Stasi HQ here at Normannenstraße too. This was the so-called “Minister-Etage”, 'the minister's floor'. It was here that Mielke and his closest inner circle of staff operated from. The interior has been largely preserved in its original state. Collectively they are by far the largest, most authentic and, in my view at least, the most impressive “artefacts” to be seen at the Stasi Museum Berlin. The room have a strange air of 1960s stuffiness about them that still feels almost stifling today. 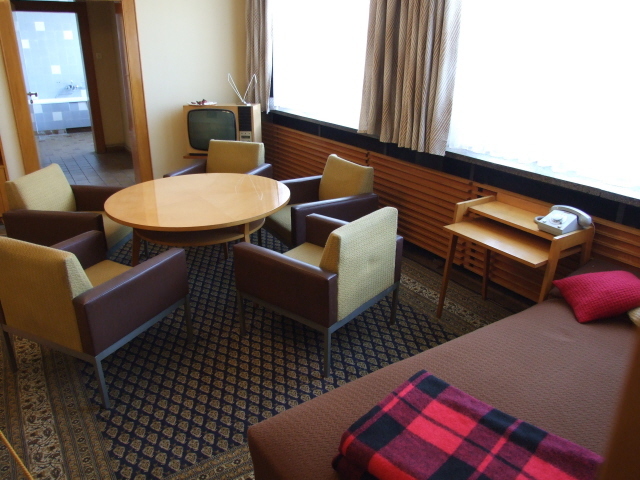 That's partly due to the typical 1960s GDR-era interior design and the furniture. There's a palpably oppressive atmosphere still lingering here not just through the knowledge of what happened here but also in terms of quite visual impressions. You can see the private rooms of Erich Mielke, which included a separate bathroom, a small living room complete with a sofa and a TV, and a kitchen. Displayed by the latter is a file card with a drawing that illustrates the exact positions of everything Mielke demanded for his breakfast. Bureaucratic perfectionism and zeal even at meal times! 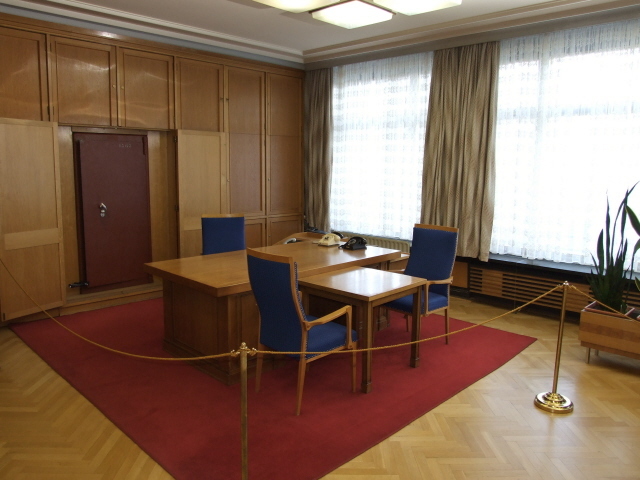 You can also see the secretariat's offices and all the telephone switchboards (with direct lines to everybody who was of importance in the GDR), file cabinets, a safe (where that red case was discovered by the prosecutors), as well as the large meeting room for the inner cadre. Next to this the inner circle's “Casino”, their separate 'mess', where they could relax over a drink. Adjacent to this is a dressing room where they would have made sure they looked properly dressed and spruced-up for meetings. At the far end of the “Casino” is another staircase leading down. In fact, this led to a separate secret entrance only for the top brass of the Stasi so that they could enter and leave the building at any time without anybody else's knowledge. But for the visitor of today, it's back down the regular staircase to the foyer. Behind the ticket booth there's a small shop where you can browse for GDR- and Stasi-related items. I gave it a miss on my latest visit (in April 2017) but when I was first there (in 2008) I did pick up a few remarkable former propagandistic pieces … so it may still be worth a look. All in all, the Stasi Museum is, these days, certainly a highlight of any trip to Berlin that takes in its GDR-era legacy. I would say that, together with Hohenschönhausen, it is probably the most significant such site (way ahead of anything Berlin-Wall-related). This is the place to go to get a proper insight into that scary state security apparatus that operated in the GDR days. A must-see for sure! But there's more, although less so for international visitors. In the foyer of the building opposite the Haus Nr 1 HQ (formerly the Stasi's main canteen and dining hall) there's an info centre. Here you can pick up copies of a wide range of information brochures and books about numerous individual aspects of the Stasi. For instance, I picked up a copy of an A-4 brochure with annotated reproductions of original files and memos released within the Stasi that dealt with the aftermath of the nuclear disaster at Chernobyl. It shows how keen the Stasi was to suppress any developments of any popular anti-nukes movement within the GDR. However, all these materials, as far as I could make out, were only available in German. So it only makes sense popping into this info centre if you have a good enough grasp of the language. There is, though, one exhibit here as well: the former guard hut that used to be on display in the foyer of the museum but must have been moved here for some reason. On it you can still read the graffito “Freiheit für meine Akte” ('freedom for my file') left by one of the protesters who had stormed the Stasi HQ back in 1990. Location: In the east of Berlin, in the district of Lichtenberg, in its southern corner. which borders Friedrichshain, at Normannenstraße. The official address of the main entrance is: Ruschestraße 103 (aka "Haus Nr. 1"), 10365 Berlin. Access and costs: A bit off the well-trodden tourist trail, but quite easily reachable; reasonably priced. Details: Getting to the museum is easy by public transport: the metro stop 'Magdalenenstraße' (line U5 – connecting to Berlin Alexanderplatz in just 15 mins.) is only a short walk away. Take the exit at the rear of the train (Ruschestraße) and use the gap between buildings on the north side of Frankfurter Allee to get into the complex. Head straight on past the car parks and other buildings until you get to house No. 1, where the museum is housed. It's signposted and labelled clearly enough so is impossible to miss. Opening times: weekdays from 10 a.m. to 6 p.m., at weekends and on public holidays from 11 a.m.; closed on Christmas Eve and New Year's Eve. Admission: 6 EUR (regular adult ticket – some concessions apply). An extra Euro is charged for a photo permit. Public guided tours take place every Saturday, Sunday and Monday, at 3 p.m. in English, at 1 p.m. in German. Tours take approximately 90 minutes. Meeting point is in the foyer, pre-registration is not necessary. For groups you can also book private tours (also available in French and Italian). For adults these cost a flat rate of 45 EUR (plus admission ticket), school groups get discounts. Private tours need to be arranged well in advance (email: info(at)stasimuseum.de). Time required: At least an hour and a half (that's how long guided tours last) but ideally you should allocate more time than that esp. if you want to go through all the texts and the audiovisual material available. I reckon you could probably spend about half a day here for a full in-depth study visit. Combinations with other dark destinations: If you want to learn more about what political persecution through the Stasi meant for its victims, you shouldn't miss the memorial site of the Hohenschönhausen prison. This can fairly easily be combined with a visit to the Stasi Museum. From the latter, take the bus or metro to Lichtenberg station and from outside the station (on its northern side) take bus 256 and get out at Genslerstraße. Other thematically related, but in comparison only mildly dark sites of interest could be the GDR-Museum (also in Mitte – easily reached from the Stasi Museum by metro U5 back to Alexanderplatz and then on foot or a couple of stops by bus 100) or the Life in the GDR Museum in Prenzlauer Berg. See also under Berlin in general. Combinations with non-dark destinations: Nothing in the immediate environs of the Stasi Museum.